Step 1. Place avocados, basil, olive oil, lemon juice into a small blender. Step 2. Blend until smooth. Step 3. Slice grape tomatoes in half and slice chicken breasts into medallions. Step 4. 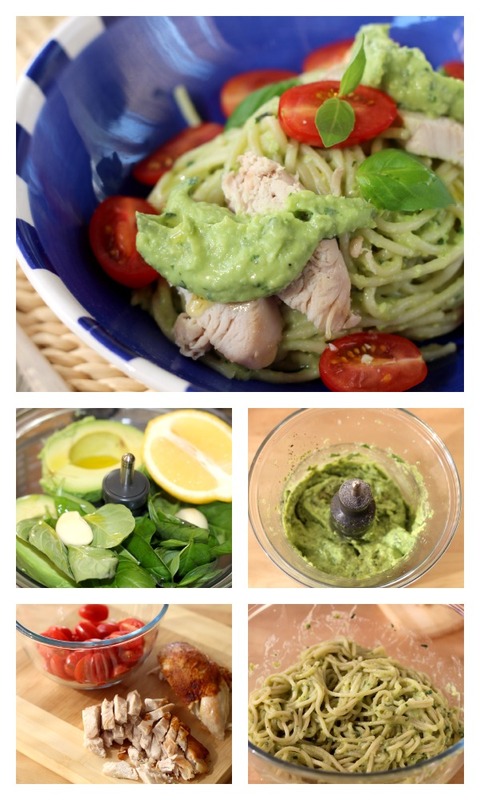 Toss pasta with two thirds of the avocado mixture and place in bowls. Top with grape tomatoes and chicken slices and spoon some extra avocado mixture on top. Season with salt and pepper. If you don't have a blender, you can crushed the garlic, chop the basil finely and mash the avocado mixture together. I used thin spaghetti but you can use any of your favourite pastas. You can make this Avocado and prawn salad for a delicious light meal or entree. If it's dip you are looking for then you should try this Avocado salsa dip with corn chips. You can make this Avocado chocolate pudding and the family will never know that it contains avocado. If you are making Mexican then this Best-ever guacamole recipe is perfect as a side to your meal. If you want your chicken and avocado to be portable then you will love these Chicken and avocado tortilla wraps. When avocados are expensive then you can stretch them by making this Creamy avocado and yoghurt dip. If you love mangos then then you find they go perfectly together in this Chicken wraps with mango and avocado salsa recipe. You can even introduce avocado to your baby with this Baby guacamole. If you love bacon then marry it up with avocado in these delicious Bacon, cheese and avocado melts. This recipe was created by Jennifer Cheung for Kidspot, New Zealand's best recipe finder.